To edit your NurseGrid profile, just tap the Me icon at the bottom of your screen, then press Profile. 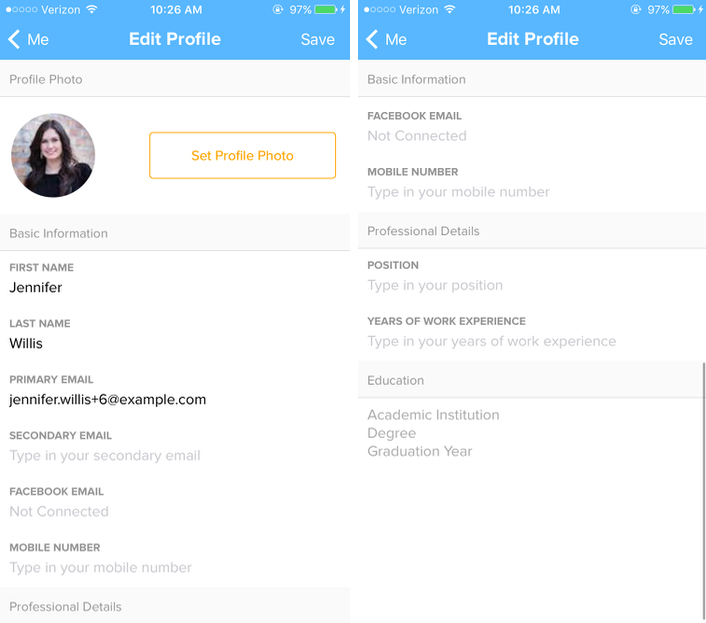 You'll be able to change your name, job position, and contact information on this screen. To edit any of these fields, just tap on them! Don't forget to hit "Save" in the top-right corner to ensure changes stick. Once you've chosen your picture, just press "Save" in the top-right corner! Add a secondary email address if you'd like to be notified at both your personal and work email addresses. To get notifications at both addresses, just make sure that the toggles next to "Primary Email" and "Secondary Email" at the bottom of the Edit Profile screen are switched on.